The University of Oxford (usually abbreviated as Oxon. for post-nominals), located in the city of Oxford, England, is the oldest university in the English-speaking world. It is also regarded as one of the world's leading academic institutions. The University has 38 independent colleges, and six permanent private halls. The university traces its roots back to at least the end of the eleventh century, although the exact date of foundation remains unclear. After a dispute between students and townsfolk broke out in 1209, some of the academics at Oxford fled north-east to the town of Cambridge, where the University of Cambridge was founded. The two universities, often jointly referred to by the portmanteau term "Oxbridge," have had a long history of academic and athletic rivalry although there are also many links and much cooperation. Their similarities in having a collegiate structure and a tutorial system has set them apart from other educational institutions. Both provide an intensity, depth and breadth of education suitable for people who go on to reach the top of their professions. In this way, they serve society by providing outstanding leadership. Admissions are based almost exclusively on academic achievement and intellectual promise as the university aims to educate the students who can best benefit from an intensive education. Spiritual, moral, cultural and social education is also an important dimension of the Oxbridge experience which is why students have to be resident in a college for all or most of the term. For many centuries the colleges, and hence the university, were all male institutions. This has changed first with the founding of women's colleges and later by making other colleges mixed. Now there are approximately an equal number of men and women. About half the student body come from independent schools and half from state schools. The University of Oxford is a member of the Russell Group of research-led British universities, the Coimbra Group (a network of leading European universities), the League of European Research Universities, and is also a core member of the Europaeum. Academically, Oxford is consistently ranked in the world's top ten universities. 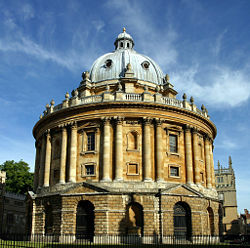 For more than a century, it has served as the home of the prestigious Rhodes Scholarship, which brings highly accomplished students from a number of countries to study at Oxford as postgraduates; these students often return to their home countries to pursue leadership positions in academia, business, or politics. Oxford has no definitive mission statement per se, but the Chancellor of the college reminds visitors that, "Oxford was the first University in the English-speaking world. Our aim is to remain at the forefront of centers of learning, teaching, and research." The school is dedicated to maintaining its long standing tradition of excellence, through its unique methods of tutorial and supervision style education. Oxford's reputation is, in fact, long and prestigious; it is often cited by educational sources as one of the top schools, both within England, and the world at large. The Times Good University Guide has named Oxford the best university in the UK since 2003. In 2006, Oxford was rated 3rd (after Harvard and Cambridge) in the THES—QS World University Rankings. In the Academic Ranking of World Universities, Oxford achieved 9th place in 2003, 8th in 2004, and 10th in 2005, 2006, and 2007. However, such a reputation does have its downside. For much of its history, the University of Oxford remained the preserve of a social elite. Though the university strove to change this in recent years, Oxford's admissions policy has continued to attract considerable public controversy. Though the University puts enormous efforts into attracting working-class students, Oxbridge entrance remains a central focus for many private and selective-state schools, and the under-representation of comprehensive school pupils remains a point of controversy. 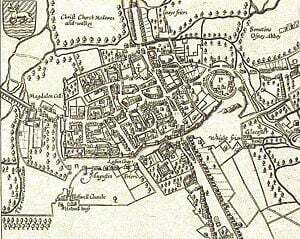 The town of Oxford was already an important center of learning by the end of the twelfth century. Teachers from mainland Europe and other scholars settled there, and lectures are known to have been delivered by as early as 1096. The expulsion of foreigners from the University of Paris in 1167, caused many English scholars to return from France and settle in Oxford. The historian Gerald of Wales lectured to the scholars in 1188, and the first foreign scholar, Emo of Friesland, arrived in 1190. The head of the University was named a chancellor from 1201, and the masters were recognized as a universitas, or corporation, in 1231. The students associated together, on the basis of geographical origins, into two “nations,” representing the North (including the Scots) and the South (including the Irish and the Welsh). 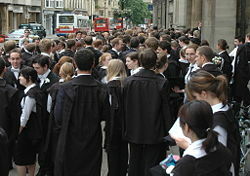 In later centuries, geographical origins continued to influence many students' affiliations when membership of a college or hall became customary in Oxford. Members of many religious orders, including Dominicans, Franciscans, Carmelites, and Augustinians, settled in Oxford in the mid-thirteenth century, gained influence, and maintained houses for students. At about the same time, private benefactors established colleges to serve as self-contained scholarly communities. Among the earliest were John de Balliol, father of the future King of Scots; Balliol College bears his name. Another founder, Walter de Merton, a chancellor of England and afterwards Bishop of Rochester, devised a series of regulations for college life; Merton College thereby became the model for such establishments at Oxford as well as at the University of Cambridge. Thereafter, an increasing number of students forsook living in halls and religious houses in favor of living at colleges. The new learning of the Renaissance greatly influenced Oxford from the late fifteenth century onward. Among university scholars of the period were William Grocyn, who contributed to the revival of the Greek language, and John Colet, the noted biblical scholar. With the Reformation and the breaking of ties with the Roman Catholic Church, the method of teaching at the university was transformed from the medieval Scholastic method to Renaissance education, although institutions associated with the university suffered loss of land and revenues. In 1636, Chancellor William Laud, archbishop of Canterbury, codified the university statutes; these to a large extent remained the university's governing regulations until the mid-nineteenth century. Laud was also responsible for the granting of a charter securing privileges for the university press, and he made significant contributions to the Bodleian Library, the main library of the university. The university was a center of the Royalist Party during the English Civil War (1642–1649), while the town favored the opposing Parliamentarian cause. Soldier-statesman Oliver Cromwell, chancellor of the university from 1650 to 1657, was responsible for preventing both Oxford and Cambridge from being closed down by the Puritans, who viewed university education as dangerous to religious beliefs. From the mid-eighteenth century onward, however, the University of Oxford took little part in political conflicts. Administrative reforms during the nineteenth century included the replacement of oral examinations with written entrance tests, greater tolerance for religious dissent, and the establishment of four colleges for women. Women have been eligible to be full members of the university and have been entitled to take degrees since 1920. Although Oxford's emphasis traditionally had been on classical knowledge, its curriculum expanded in the course of the nineteenth century and now attaches equal importance to scientific and medical studies. 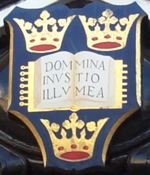 The list of distinguished scholars at the University of Oxford is long and includes many who have made major contributions to British politics, the sciences, medicine, and literature. More than forty Nobel laureates and more than fifty world leaders have been affiliated with the University of Oxford. Since its foundation in 1823, the Oxford Union, a private club devoted to formal debating and other social activities, has numbered among its members many of Britain's most noted political leaders. The Radcliffe Camera, built 1737-1749, holds books from the Bodleian Library's English and History collections. Oxford’s central research library is the Bodleian, founded in 1598 by Sir Thomas Bodley. With over 8 million volumes housed on 117 miles of shelving, it is the second-largest library in the UK, after the British Library. It is a legal deposit library, which means that it is entitled to request a free copy of every book published in the UK. As such, its collection grows at a rate of over three miles of shelving every year. Its main central site is comprised of the Radcliffe Camera, the Old Schools Quadrangle, the Clarendon Building, and the New Bodleian Building. A tunnel underneath Broad St connects the buildings. There are plans to build a new book depository in Osney Mead, and to remodel the New Bodleian building to better showcase the library’s various treasures (which include a Shakespeare First Folio and a Gutenberg Bible) as well as temporary exhibitions. Several other libraries, such as the Radcliffe Science Library and the Oriental Institute Library also fall within the Bodleian Group’s remit. As well as the Bodleian, there are a number of other specialized libraries in Oxford, such as the Sackler Library which holds classical collections. In addition, most academic departments maintain their own library, as do all colleges. The University’s entire collection is cataloged by the Oxford Libraries Information System, though with such a huge collection, this is an ongoing task. Oxford University Library Services, the head of which is Bodley’s Librarian, is the governing administrative body responsible for libraries in Oxford. The Bodleian is currently engaged in a mass-digitization project with Google. Oxford maintains a number of museums and galleries, in addition to its libraries. The Ashmolean Museum, founded in 1683, is the oldest museum in the UK, and the oldest university museum in the world. It holds significant collections of art and archaeology, including works by Michaelangelo, da Vinci, Turner, and Picasso, as well as treasures such as the Parian Marble and the Alfred Jewel. The Ashmolean is currently undertaking a £60m redevelopment, which will double the display space as well as provide new facilities. 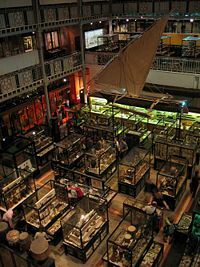 The Museum of Natural History holds the University’s anatomical and natural history specimens. It is housed in a large neo-Gothic building in the University’s Science Area. Among its collection are the skeletons of a Tyrannosaurus rex and triceratops, and the most complete remains of a dodo found anywhere in the world. It also hosts the Simonyi Professorship of the Public Understanding of Science. The Museum of the History of Science is housed on Broad St in the world’s oldest-surviving purpose-built museum building. It contains 15,000 artifacts, from antiquity to the twentieth century, representing almost all aspects of the history of science. In the Faculty of Music on St Aldate’s is the Bate Collection of Musical Instruments, a collection mostly comprising of instruments from Western classical music, from the medieval period onwards. 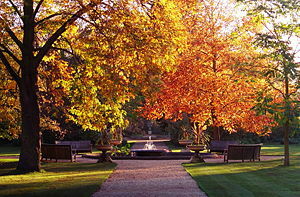 The Botanic Garden is the oldest botanic garden in the UK, and the third-oldest scientific garden in the world. It contains representatives from over 90 percent of the world’s higher plant families. Christ Church Picture Gallery holds a collection of over 200 old master paintings. The university's formal head is the Chancellor (currently Lord Patten), though as with most British universities, the Chancellor is a titular figure, rather than someone involved with the day-to-day running of the university. Elected by the members of Convocation, a body comprising all graduates of the university, the Chancellor holds office until death. The Vice-Chancellor is the de facto head of the University. Five Pro-Vice-Chancellors have specific responsibilities for Education; Research; Planning and Resources; Development and External Affairs; and Personnel and Equal Opportunities. The University Council is the executive policy-forming body, which consists of the Vice-Chancellor as well as heads of departments and other members elected by Congregation, in addition to observers from the Student Union. Congregation, the "parliament of the dons," comprises over 3,700 members of the University’s academic and administrative staff, and has ultimate responsibility for legislative matters: It discusses and pronounces on policies proposed by the University Council. Oxford and Cambridge (which is similarly structured) are unique for this democratic form of governance. Two university proctors, who are elected annually on a rotating basis from two of the colleges, supervise undergraduate discipline. 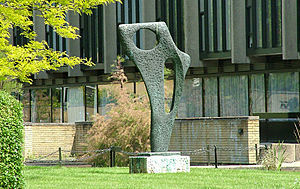 The collection of University Professors is called the Statutory Professors of the University of Oxford. They are particularly influential in the running of the graduate programs within the University. Examples of Statutory Professors include the Chichele Professorships, the Drummond Professor of Political Economy, and so forth. The various academic faculties, departments, and institutes are organized into four divisions, each with their own Head and elected board. They are the Humanities Division; the Social Sciences Division; the Mathematical, Physical and Life Sciences Division; and the Medical Sciences Division. Undergraduate teaching is centered upon the tutorial, where one to three students spend an hour with a teacher discussing their week’s work, usually an essay (arts) or problem sheet (sciences). Students usually have around two tutorials a week. These tutorials are complemented by lectures, classes, and seminars, which are organized on a departmental basis. Graduate students undertaking taught degrees are usually instructed through classes and seminars, though naturally there is more focus upon individual research. The university itself is responsible for conducting examinations and conferring degrees. The passing of two sets of examinations is a prerequisite for a first degree. The first set of examinations, called either Honor Moderations ("Mods" and "Honor Mods") or Preliminary Examinations ("Prelims"), are usually held at the end of the first year (or after five terms in the case of Classics). The second set of examinations, the Final Honor School ("Finals"), is held at the end of the undergraduate course. Successful candidates receive first, second, or third-class honors based on their performance in Finals. Research degrees at the master's and doctoral level are conferred in all subjects studied at graduate level at the university. Magdalen College on May Morning, 2007. There are 39 colleges of the University of Oxford and seven Permanent Private Halls, each with its own internal structure and activities. Colleges have responsibility for admitting undergraduates and organizing their tuition; for graduates, this responsibility falls upon the departments. All students and many of the academics are attached to colleges, where they live, eat and socialise. It is also the place where students receive one on one teaching sessions, known as tutorials. Each college appoints its own teaching staff and fellows in each subject; decides which students to admit, in accordance with University regulations and is responsible for the domestic arrangements and welfare of its own undergraduates, graduates, post-doctoral researchers, and staff in general. Colleges admit students to study a wide variety of subjects. This is deliberate as it means that students to meet, talk to and make friends with people from different disciplines thus broadening their education. A graduate remains a member of his or her college for life. The heads of Oxford colleges are known by various titles, according to the college, including warden, provost, principal, president, rector, or master. The colleges join together as the Conference of Colleges to discuss policy and to deal with the central University administration. Teaching members of the colleges (fellows and tutors) are collectively and familiarly known as dons (though the term is rarely used by members of the university itself). 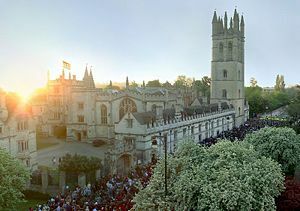 Many University of Oxford colleges host overseas students (primarily from American universities) enrolled in study abroad programs during the summer months. Oxford University Department for Continuing Education caters mainly for mature and part-time students. 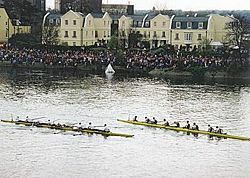 Exhausted crews just after the finish of the 2002 Oxford and Cambridge Boat Race. Students in subfusc outside Examination Schools. Note variety of gowns such as the Commoners' gown and the Graduate Student gown. 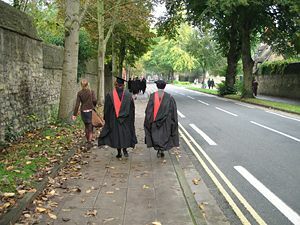 The University of Oxford has a long tradition of academic dress, and a visitor to Oxford during term will see academic dress worn on a regular basis. The lay-type gown derives from a garment fashionable in Elizabethan times. It is less voluminous than the clerical-type gown, and has a flap collar and long closed sleeves with arm slits just above the elbow, except for the Commoners' gown, which is sleeveless. Hoods in Oxford are of three shapes. Doctors (except Doctors of Clinical Psychology) and Bachelors of Divinity wear hoods in the Oxford full shape, scarlet in the case of doctors and black in the case of Bachelors of Divinity. All other hoods can be either in the Burgon shape or the Oxford simple shape, though some are traditionally made in one shape or the other. Generally, hoods are worn by graduates whenever subfusc is worn, but sometimes they are worn with an ordinary tie, such as by a lecturer at a public lecture. Men wear a mortarboard (also known as a square or trencher cap), which is not worn indoors, except by the Chancellor, Vice-Chancellor, and Proctors. When meeting the Vice-Chancellor, Proctors, or other senior official of the university in the street, it is traditional for a man to touch or raise his cap. In practice, few people now wear their caps, and instead carry their caps on occasions where caps are required. Women may choose between the mortarboard or the soft cap. The soft cap is not removed indoors, although the mortarboard may now be removed or left on indoors at the wearer's discretion. Doctors in the lay faculties (those except Divinity and Philosophy) wear Tudor bonnets, which are round and made of velvet. Members of Her Majesty's Forces may wear their service uniform with gown and hood (for graduates) in place of subfusc. On occasion, uniform swords may be worn. Persons in Holy Orders may wear clerical dress instead of subfusc. Subfusc is worn at university matriculation, at university examinations and degree ceremonies and at Encaenia. During exams, candidates often also wear a carnation in their buttonholes: White for the first exam, pink thereafter, and red for the final exam of the run. Although this system has differed over time, this is the one currently advised by the University and its Colleges. Formal Hall or Formal Meal is the traditional meal held at some of the older universities in the United Kingdom at which students dress in formal attire and often gowns to dine. The nature of Formals varies widely between the colleges and halls that hold them. In some colleges, Formals may be held every night, and are simply a second sitting of hall at which gowns are worn and grace is read. In other colleges, Formals may be special events to which guests from outside the college are invited. The wearing of gowns at formals is compulsory at some colleges and various other traditions are usually observed, including grace said in Latin or English. The wearing of gowns may sometimes constitute the only dress code; in other cases, formal wear (for example, a lounge suit for men or equivalent for women) is required in addition to, or instead of, the gown. Almost all Oxford formal halls include a High Table, exclusively for the Senior Common Room of the college and their guests, with students eating at the lower tables. The high table is often raised above the floor level of the hall. A few of the more modern colleges, for example Linacre College and Wolfson College, have discontinued (or never had) this practice, in order to promote equality between fellows and students. There may be one or more after dinner speakers at the end of the dinner or even between courses if it is a special occasion. Oxford has had a role in educating four British and at least eight foreign kings, 56 Nobel prize-winners, three Fields medallists, three Oscar winners, 25 British Prime Ministers, 28 foreign presidents and prime ministers, seven saints, 86 archbishops, 18 cardinals, and one pope. Eight of the last 12 British Prime Ministers have been Oxford graduates. All four Prime Ministers of the United Kingdom who served between 1880 and 1905—Gladstone, Lord Salisbury, Lord Rosebery, and Balfour—were educated at Eton and then at Christ Church. T. E. Lawrence was both a student and a don at Oxford, while other illustrious members have ranged from the explorer, courtier, and man of letters Sir Walter Raleigh to the media magnate Rupert Murdoch. The founder of Methodism, John Wesley, studied at Christ Church and was elected a fellow of Lincoln College. The Burmese Democracy Activist and Nobel Laureate Aung San Suu Kyi was a student of St Hugh's College, Oxford. Amongst the long list of writers associated with Oxford are Evelyn Waugh, Lewis Carroll, Aldous Huxley, Oscar Wilde, C. S. Lewis, J.R.R. Tolkien, Graham Greene, Phillip Pullman, Vikram Seth, and Plum Sykes, the poets Percy Bysshe Shelley, John Donne, A. E. Housman, W. H. Auden, and Philip Larkin, and Poets Laureate Thomas Warton, Henry James Pye, Robert Southey, Robert Bridges, Cecil Day-Lewis, Sir John Betjeman, and Andrew Motion. Scientists include Stephen Hawking, Richard Dawkins, and Nobel prize-winner Anthony James Leggett, and Tim Berners-Lee, co-inventor of the World Wide Web. Actors Hugh Grant, Kate Beckinsale, Dudley Moore, Michael Palin, and Terry Jones were undergraduates at the University, as were Oscar winner Florian Henckel von Donnersmarck and filmmaker Ken Loach. ↑ Oxford University, A Brief History of the University. Retrieved June 5, 2007. ↑ 3.0 3.1 The University of Oxford (2007), Welcome from the Chancellor. Retrieved October 22, 2007. ↑ The Guardian, Education Guardian 2005. Retrieved July 31, 2006. ↑ Topuniversities.com (2006), THES—QS World University Rankings. Retrieved October 23, 2007. ↑ Institute of Higher Education, Shanghai Jiao Tong University (2005), Academic Ranking of World Universities 2007. Retrieved October 23, 2007. ↑ Telegraph.co.uk (2006), Should Oxford discriminate in favor of state school students? Retrieved October 23, 2007. ↑ Richard Tames, A Traveler's History of Oxford (New York: Interlink, 2002, ISBN 1566564670). ↑ 9.0 9.1 Oxford University Gazzette (2005), A University Library for the Twenty-first Century. Retrieved October 23, 2007. ↑ Bodleian Library (2006), Oxford-Google Digitization Programme. Retrieved October 23, 2007. ↑ University of Oxford—Ashmolean Museum (2005), About the Museum: History & Future. Retrieved October 22, 2007. ↑ University of Oxford—Ashmolean Museum (2005), Transforming the Ashmolean. Retrieved October 23, 2007. ↑ Museum of the History of Science, Oxford (2006), Overview. Retrieved October 23, 2007. ↑ G.W. Shaw, Academical Dress of British and Irish Universities (Chichester: Philmore & Co. Ltd, 1995, ISBN 085033974X). Brooke, Christopher, and Roger Highfield. Oxford and Cambridge. Cambridge: Cambridge University Press, 1988. ISBN 0521301394. Catto, Jeremy (ed.). The History of the University of Oxford. Oxford: Oxford University Press, 1993. ISBN 978-0199510122. De-la-Noy, Michael. Exploring Oxford. London: Trafalgar Square, 1992. ISBN 978-0747203865. Feiler, Bruce. Looking for Class: Days and Nights at Oxford and Cambridge. New York: Perennial, 2004. ISBN 006052703X. Hibbert, Christopher. The Encyclopaedia of Oxford. Papermac, 1992. ISBN 978-0333486146. Kerr, Alex (ed.). The Burgon Society Annual 2004. The Burgon Society, 2005. ISBN 0954411064. Miles, Jebb. The Colleges of Oxford. London: Constable, 1992. ISBN 978-0094691803. Morris, Jan. The Oxford Book of Oxford. Oxford: Oxford University Press, 2002. ISBN 0192804073. Seccombe, Thomas, and H. Scott (eds.). In Praise of Oxford. London: Constable, 1912. Shaw, G.W. Academical Dress of British and Irish Universities. Chichester: Philmore & Co. Ltd, 1995. ISBN 085033974X. Snow, Peter. Oxford Observed. London: John Murray, 1992. ISBN 978-0719547072. Tames, Richard. A Traveler's History of Oxford. New York: Interlink, 2002. ISBN 1566564670. Venables, D.R., and R.E. Clifford. Academic Dress of the University of Oxford. Oxford: Oxford University Press, 1998. ISBN 0952163004. The Queen's College, Oxford, quad. Oxford University Academic Dress Regulations. History of "University of Oxford"